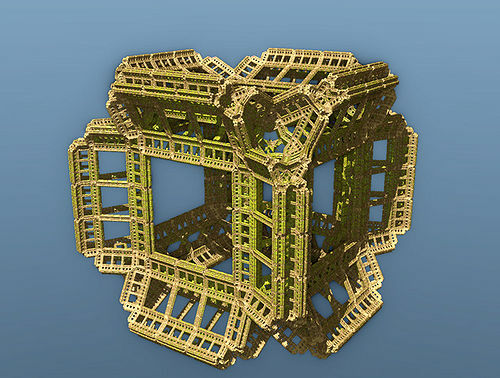 I continue to dig through the treasure trove of fractal visions over at Fractalforums.com. In fact, lately it seems to me that the center of the fractal world has shifted to Fractalforums.com. It’s become the Paris/Milan/New York/London/Tokyo for new fractal fashions. 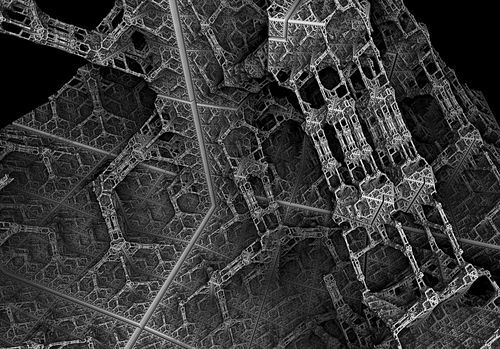 Is there anything new and exciting in the fractal world right now that doesn’t have its roots in Fractalforums.com? Although the obvious sequence of parameter adjustments is what this image is all about, and I think it was posted merely as an illustration in a Fractalforums.com thread on Kaleidoscopic (escape-time) IFS fractals (KIFS, for short), the color palette really makes this image much more than merely functional. I think Knighty realized this too since he’s used this same palette quite a bit. It’s one of the best I’ve seen on this new fractal frontier. 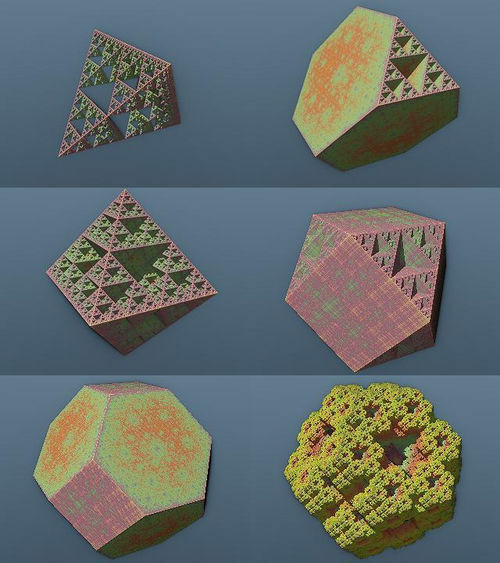 Here are some renderings of a class of fractals which I call “Kaleidoscopic IFS”. There is a big variations of shapes one can get with this method. There are many other known fractals that may appear from nowhere. I’ve already met the Koch curve, cantor dust and others I don’t know the name. The variation of possible shapes, from geometric figures to organic forms, still amazes me. The possibilities are infinite , not only by changing the parameters but also by changing the algorithm. What I’ve described in the O.P. is actually what I’ve explored so far. The main ingredients are the folding and the stretching, that is, kneading the space . Then add some salt and spice. Seriously! In the case of this class of fractals, folding are done about planes and stretching is an homothety. The rotations may be the salt and spice. I realize now that one can insert as many rotations between the foldings. In principle other transformations than a rotation can be used (but I may be wrong). The nice thing with rotation (and other orthonormal transformations) is that the distance estimation remains very simple and the generated distance field is continuous. I guess because they don’t add stretching. I think the kneading process is what is done to generate escape time fractals in general… but this is a little bit off topic. I’ll start another thread. If you read the forum thread you’ll see that many other people get involved. In fact, according to Knighty’s remark, “PS: Most ideas behind these fractals were found in this forum” there’s been a lot of collaboration going on already. The sort of group exchange of code and ideas which seems to be the hallmark on Fractalforums.com immediately starts to take place. 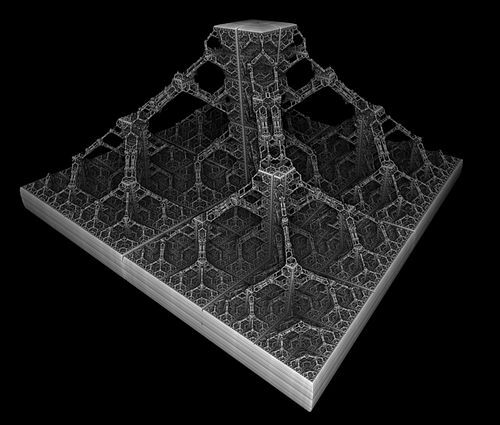 In addition to the regular 3D fractal enthusiasts, the venerable Jos Leys (of 3D Kleinian fame) joins in as well. Only a truly great knight would have so many squires and inspire so many others to join in his exploits. Is there an Order of Sierpinski? An iterated knighthood? 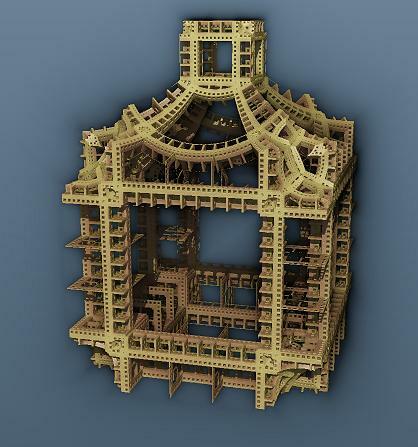 Pagode is an interesting construction. 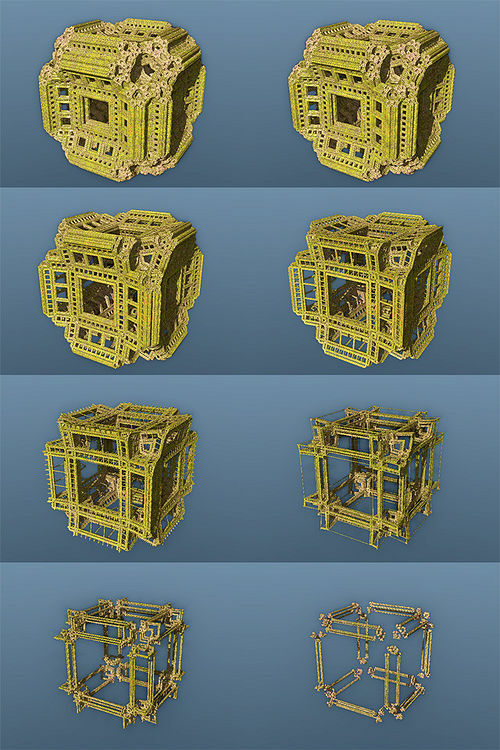 Although a higher resolution rendering would probably be even more impresssive, even this small version shows the sort of intricately detailed and vividly rendered imagery that Knighty has discovered with his KIFS fractals. Like the Mandelbox, these KIFS are very creative in that they seem to have an almost endless number of variations depending on how one folds and twists the characteristics of the formula. You know, I suppose if you’d seen this Pandora_seashell lying on the lawn in your backyard you might just think it was a rotting leaf. But sometimes the “art” is in looking more closely at something that we’d otherwise, uh… step on. Art is on the boot of the beholder. Math is a very natural thing and for that reason I think it’s easy to make assumptions about mathematical, or algorithmic, imagery. Such as assuming that it’s repetitive or predictable. But I think Knighty’s recent discovery of these Kaleidoscopic IFS fractals shows that there’s still plenty of things to be discovered in this area (it only started at the beginning of this month, May 1st, 2010). Maybe there’s no end to all of this and this is merely the beginning? Well, it’s all happening over at Fractalforums.com, so stay tuned to that forum if you want to catch the next great event in the fractal world. Perhaps some day all the rest of the fractal kingdom will be mere footnotes to Fractalforums.com. While Knighty and his other fellow members of the Round Table feast on roast boar and crash their flagons together in an endless round of toasts and heroic tales of fractal exploits. 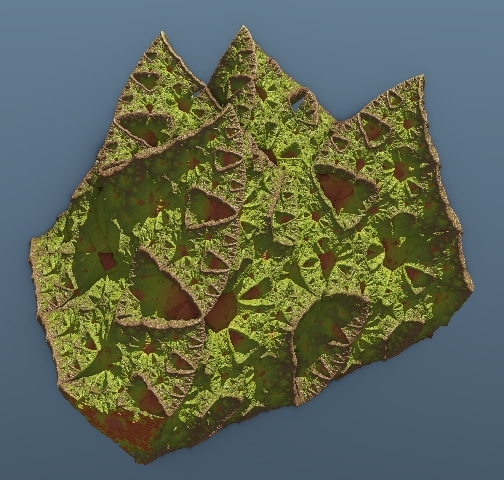 Also, special thanks to Tglad and msltoe whose ideas are at the heart of this type of fractals. You may wonder why the name “Pandora sea shell”. It’s just because it’s hollow and have so many openings. So you can imagin a wierd alien, fractal shaped mollusk, that lived once inside ;o).